Route map showing quick-transport options throughout the mainland Morrowind. This page is the Tamriel Rebuilt complement to this one. 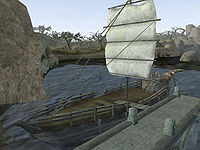 In addition to the guild guides, boats, and silt strider caravans found in Vvardenfell, the mainland also features river striders, large aquatic bugs that provide an alternative to boats. However, there is no propylon network on the mainland. Boat transport is available to most of the coastal cities. There are various types of seagoing transports, the most common being a large single-masted three-deck ship, or the smaller open boats found in the poorer settlements. 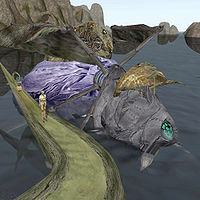 These huge aquatic arthropod are bred and raised by the Telvanni to act as an alternative to boats. A large fungus is grafted to the top of their abdominal shell, living symbiotically with the animal; in that fungus a cabin for passengers is hollowed. The therionaut takes place atop the creature's head, under a small overhang supported by the strider's antenna. The antenna are coated in a fungal infection which allows the therionaut to control the strider by manipulating them. Between the head and the abdomen, a thin thorax sports four long legs and two impressive wings. While the wings cannot be used for flight, the creature can use them as sails to gain speed. 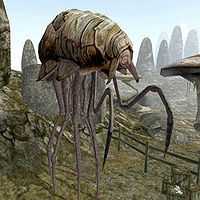 Colossal creatures resembling gigantic fleas, silt striders are domesticated to act as beasts of burden for long distance travel. The Sadas Plantation breeds silt striders, as well as netch and the relatively smaller plain striders. Outside of the transportation trade, striders are valued for their hardy chitin. The Mages Guild maintain a network of teleporters, the Guild Guides, adept mystics who can teleport other persons instantaneously to a well-known location. In some places where the Guild cannot hold a full-fledged guildhall but where a guild guide is needed anyway, a small relay might be maintained instead; in these places the guide's services are usually restricted to guildmates and Imperial officials, while guides in guildhalls offer their services to anyone who can afford them. After being attacked by assassins, if you speak to guards on the mainland, they will not direct you to Apelles Matius but to Senillos Tulnus. After that, Garrus Melorus will offer you free, instant transport to Mournhold when you ask him about Transport To Mournhold. Effe-Tei in the Royal Palace can transport you back. He can also still send you to Ebonheart as he doesn't know whether you arrived thanks to Garrus Melorus or to Asciene Rane.